HUIA 21st October 1902, believed to be at Wellington. Photographer unknown. 1878 built for C Seager. 1879 March sold to C. Seager, W. Bishop and P. Moeller. 1879 November sold to C. Seager, W. Bishop, P. Moeller and S.J. Johnston. 1882 sold to C. Seager and P. Moeller. 1884 sold to C. Seager and J. Joseph. 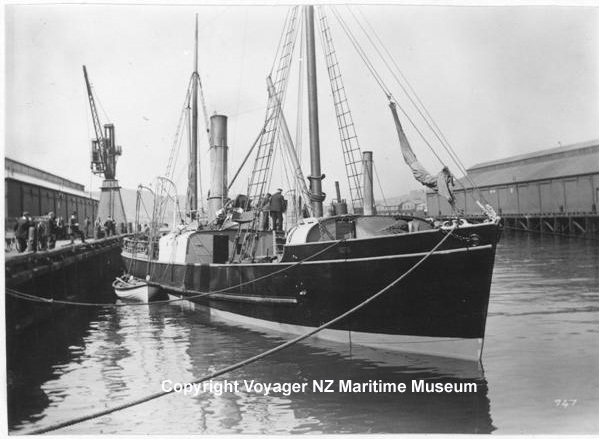 1901 sold to Wellington and Wanganui Steam Packet Company Limited. 1917 sold to W.H. Brewer. 1924 sold to C.V. Clare and H.M. Warner. A 1924 letter from the Northern Steam Ship Company says they were 'friends' and owners of the S.S. HUIA in trust for the Company. She was bought as she had been 'interfering with our Whangarei trade'. 1927 dismantled at Auckland, and hull sunk in Western Reclamation.